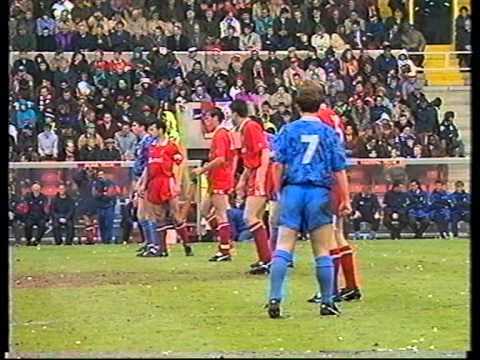 Swindon and Tranmere clashed twice after the regular season in the 1990's - once off the pitch, and once on it. 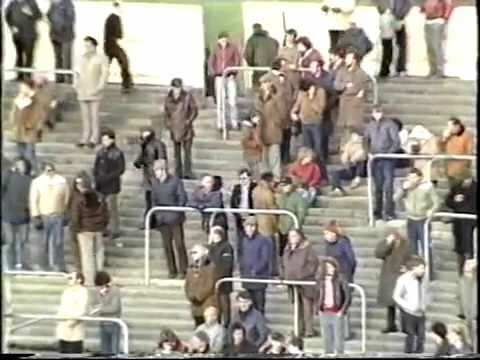 After Swindon were demoted two divisions for illegal payments to players in 1990, Tranmere were originally one of the beneficiaries - being selected for promotion to Division Two after they had lost their play-off final to Notts County. 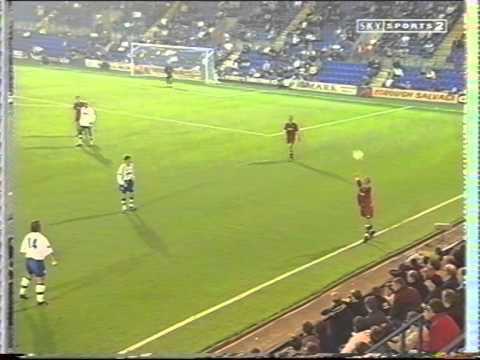 When Swindon were reinstated to Division Two on appeal, Tranmere had to remain in the Third Division for another season. 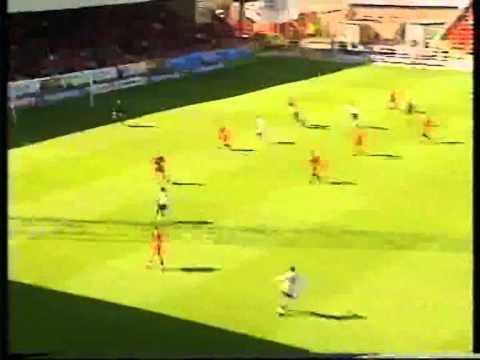 Just three years later though, after Tranmere were promoted, the two clubs met in the playoff semi-finals, this time contesting for a place in the newly created Premiership. 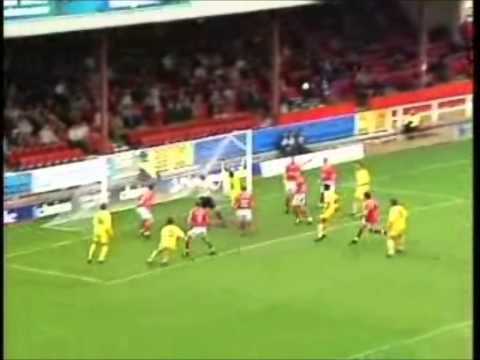 Swindon made an amazing start to the game, scoring twice in the opening three minutes at the County Ground - eventually going on to win the first leg 3-1. 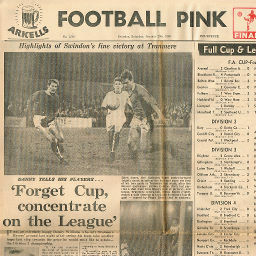 Three days later, Swindon travelled to Birkenhead for the second leg, returning with a 5-4 aggregate win to take them to the final at Wembley where they gained the promotion to the top flight that had been denied to them previously. 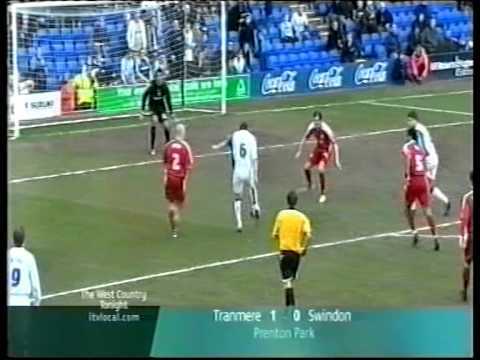 Garry Nelson scores direct from a corner to give Swindon the lead against Tranmere - but Colin Bailie nets his second own goal in three games to draw the game, despite the Town dominating. 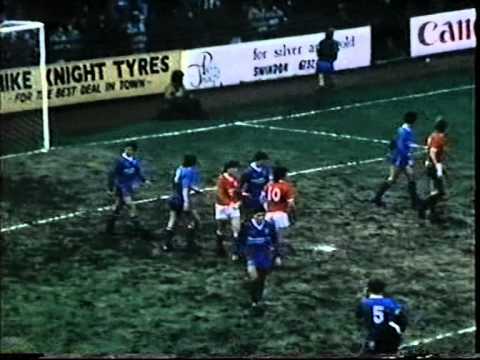 Mark Dempsey makes his debut for the Town on loan from Manchester United - an Andy Rowland penalty and a second half Peter Coyne goal giving the Town their fifth successive home victory against Tranmere, in front of only 2,700 fans. The three top goalscorers in the League all meet at Prenton Park - needless to say, none of them are able to find the net. Duncan Shearer's 30th and 31st goals of the season moves the Town within four points of the play-offs. Two goals from David Mitchell give the Town victory over promotion rivals Tranmere - who are not pleased after the initial game is abandoned due to floodlight failure with them leading 2-1. 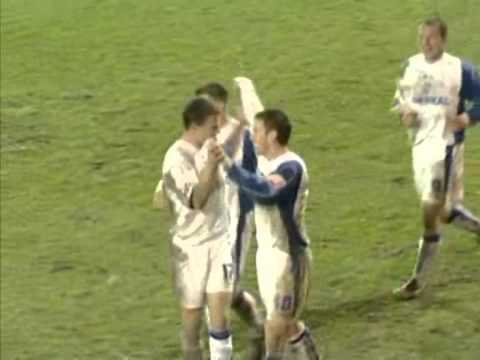 Despite taking the lead through David Mitchell, a second half Kenny Irons hat-trick gives Tranmere the points. An amazing start sees the Town two goals to the good within the opening five minutes, and they grab another before half-time - but Tranmere pull one back in the second half. 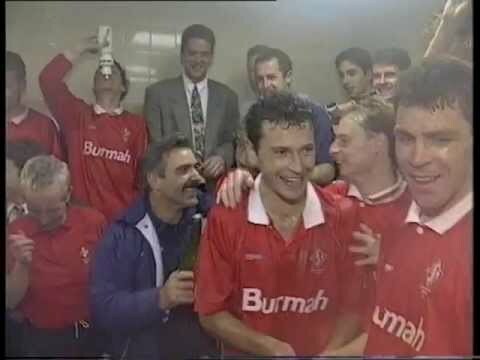 Swindon make an amazing start to their play-off tie - scoring two goals in the opening three minutes, notching another just 28 minutes in after John Aldridge has a goal controversially ruled out. Tranmere win the match but are defeated on aggregate, as they Town cling on to secure their place at Wembley. Tranmere win the match but are defeated on aggregate, as the Town cling on to secure their place at Wembley. 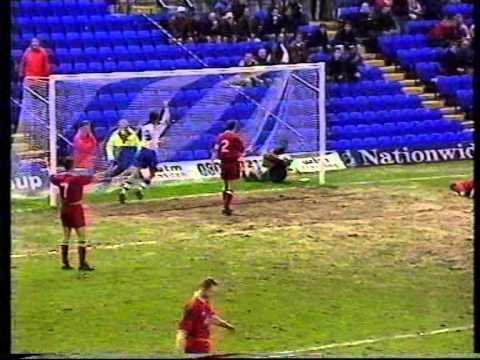 After coming from behind to take a half-time lead, Swindon concede twice in the second half to John Aldridge and Pat Nevin - losing 3-2 at a Prenton Park ground undergoing development work. 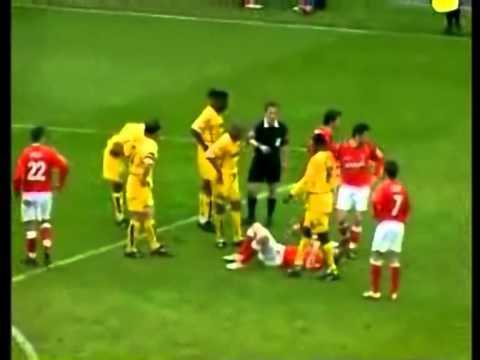 Central News preview the Watford game, as record signing Joey Beauchamp is set to make his full debut. 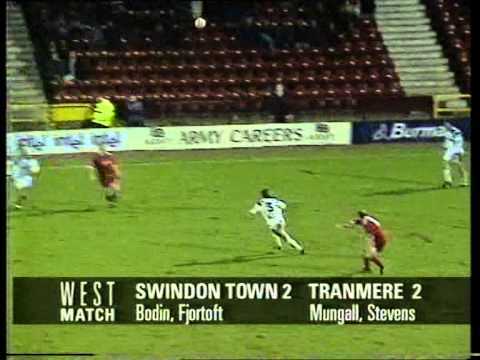 Paul Bodin and Jan Fjortoft score for the Town to register Steve McMahon's first point as Town boss. 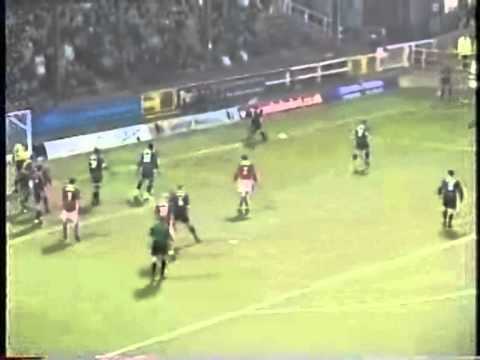 Mark Walters nets a penalty, and Kevin Horlock thumps one in off the post - the Town winning despite a late John Aldridge consolation. 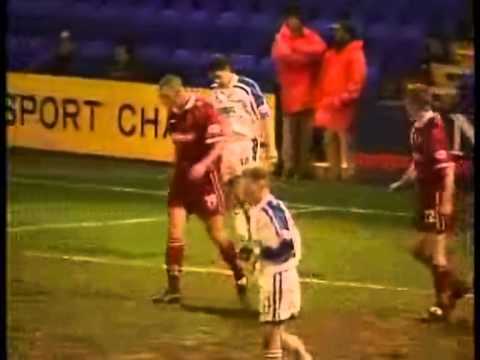 Two Pat Nevin goals gives Tranmere the win over the Town. A superb strike from Mark Walters, and a goal from Manchester United loanee Chris Casper secures victory for the Town over Tranmere. 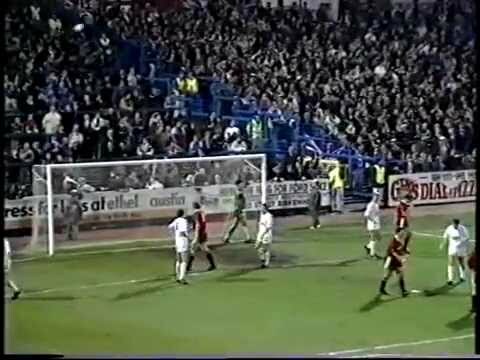 The "McMahon out" chants begin to surface, as goal-shy Tranmere notch three past Swindon - making it just one win in twelve for the Town. 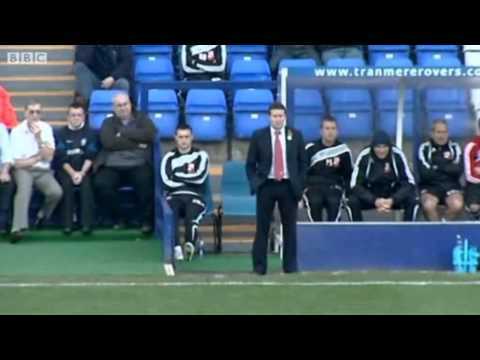 Caretaker manager Mike Walsh leads the Town to a goalless draw against ten man Tranmere. 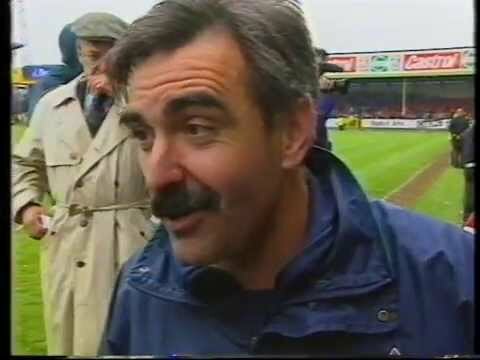 Swindon delay the confirmation of their relegation by another week, with a 3-1 win over Tranmere. 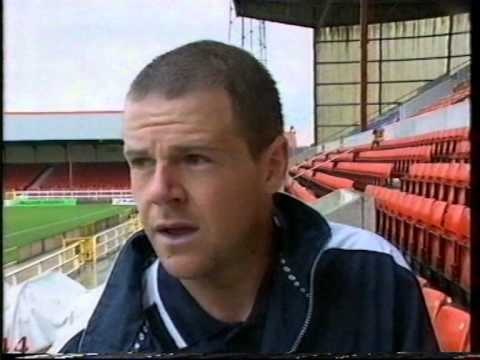 After Giuliano Grazioli pounces on a goalkeeping error to give the Town an early lead, Tranmere look to have turned the game around with two goals of their own - but a late Andy Gurney strike wins a draw for Swindon, and there is still time for Graham Allen to get sent off. Danny Invincibile rounds the keeper and misses, as the Town play out a 0-0 draw at Prenton Park. Sam Parkin gives Swindon an early lead - but despite Gary Jones' late leveller, it's enough to make it four games without defeat. Andy Gurney's superb free-kick is enough to win the game at Birkenhead. 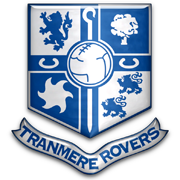 Gary Jones' last minute penalty wins the game for Tranmere - and after losing just once in their first eleven games, this defeat is the Town's fourth on the spin. 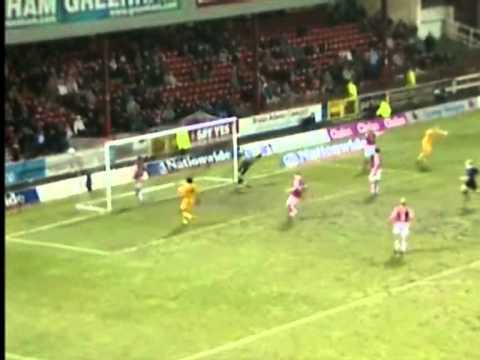 Sam Parkin's double makes it back-to-back 2-0 home wins for Swindon. 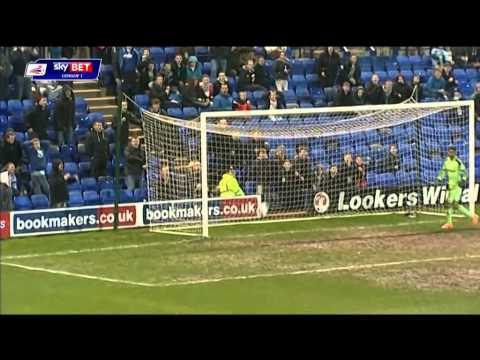 A Paul Hall double sees Tranmere to victory over the Town. 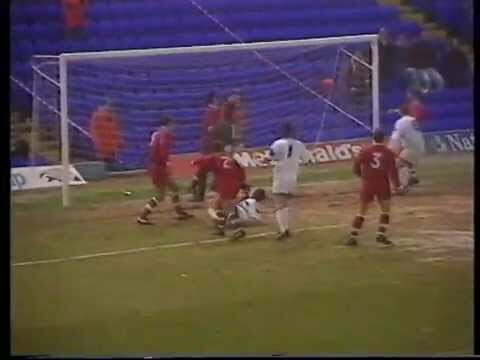 Town go down to the only goal at Tranmere. The home defeat to Tranmere leaves Swindon in serious trouble at the bottom of the table - one point from safety having played two games more than some of the teams around them. Barry Corr nets the only goal of the game with just two minutes left on the clock. Two first half goals are enough to seal victory for Tranmere. Swindon give an impressive performance in the season's opener - easily turning over Tranmere at the County Ground. Swindon are unable to take advantage of Ian Goodison's sending off just before the hour - Tranmere holding on to their one goal lead. Swindon thump Tranmere at Prenton Park with an impressive performance. 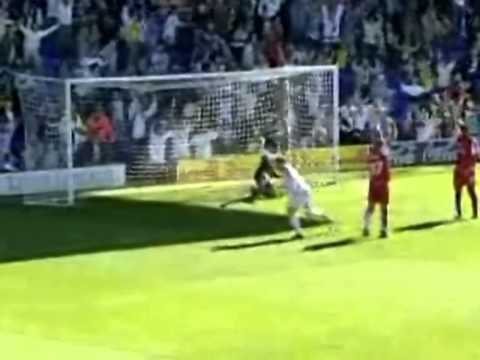 Tranmere make it easy for the Town to record a 3-0 win - keeping Swindon in second place. Swindon sneak victory at Prenton Park through Miles Storey's fortunate goal - and despite the home side hitting the woodwork twice. 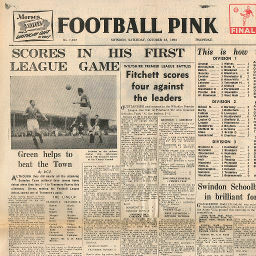 Click to view a newspaper report of Swindon's 1-2 defeat against Tranmere Rovers in the 1958-1959 season. 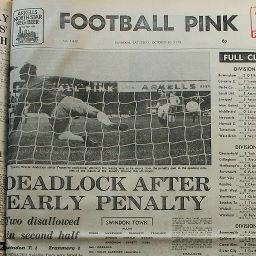 Click to view a newspaper report of Swindon's 1-3 defeat at Tranmere Rovers in the 1958-1959 season. 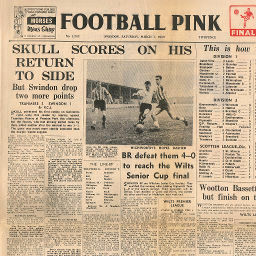 Click to view a newspaper report of Swindon's 3-1 win against Tranmere Rovers in the 1967-1968 season. 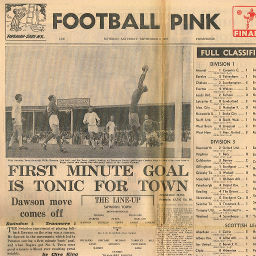 Click to view a newspaper report of Swindon's 5-3 win at Tranmere Rovers in the 1968-1969 season. 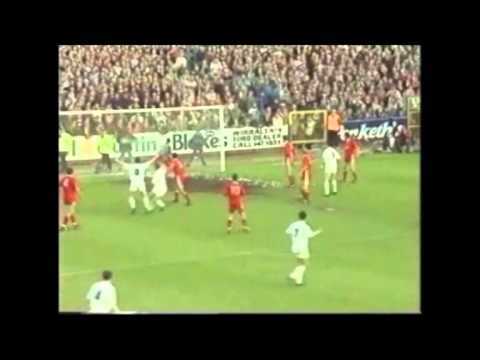 Click to view a newspaper report of Swindon's 1-1 draw against Tranmere Rovers in the 1976-1977 season. 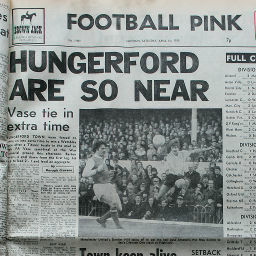 Click to view a newspaper report of Swindon's 1-1 draw at Tranmere Rovers in the 1977-1978 season. 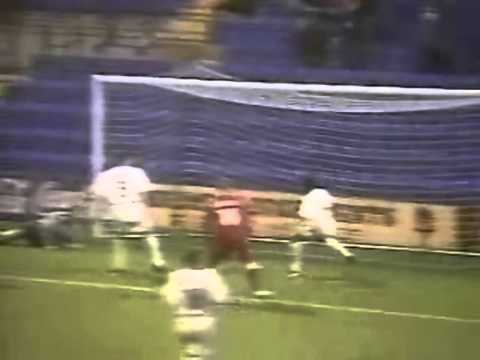 Tranmere Rovers win 2-1 on aggregate.